Enjoy the movie a full two days early in IMAX as well as receive an event giveaway item. Be sure to get there on time to experience the magic as this showtime will not have trailers! 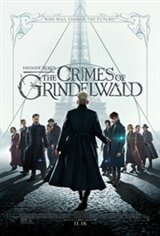 In an effort to thwart Grindelwald's plans of raising pure-blood wizards to rule over all non-magical beings, Albus Dumbledore enlists his former student Newt Scamander, who agrees to help, unaware of the dangers that lie ahead. Lines are drawn as love and loyalty are tested, even among the truest friends and family, in an increasingly divided world.